Is this important in the scheme of hair growth and hair loss? Male-pattern baldness is a result of a gene in the body that converts large quantities of testosterone into DHT (dihydrotestosterone). 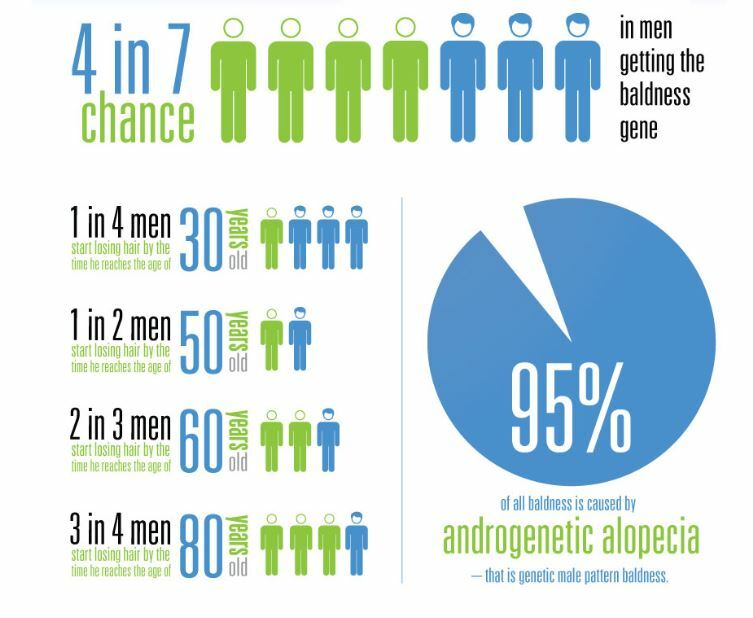 Hair loss occurs to some extent in 60-70% of all men, and 4-8% of women. This balding process is caused by hereditary factors. You inherit the tendency to lose hair from either of your parents. Male Pattern Baldness in severe cases can manifest in advanced hair loss, leaving only a thin band of hair around the sides and back, known as a “horseshoe”. The female baldness pattern, although can in some cases mimics the male pattern more normally takes the form of diffused loss behind the hairline and over the top of the scalp. Besides the genetic forms of hair loss that make up around 90% of hair loss conditions, there are more examples of how hair loss can occur, some reversible conditions. Such examples of other types of hair loss may include but are not limited to stress, iron deficiency, thyroid disease, traction alopecia, trauma and medication. It is important before any treatment is administered a proper consultation assessment is performed. Did You Know This ABout Your Hair? Hair is more elastic than you think! It can expand by up to 30% of its original length when wet. At any given time approximately 90% of your hair is in a hair growth phase and 10% is in a resting phase. There is no difference between male and female hair in terms of growth cycle and structure. On average we shed around 100 hairs per day, this is not necessarily hair loss but shedding that is naturally replaced within the growth cycle. Cutting your hair does not affect its growth, but it does help to avoid cosmetic damage such as split ends, which can work their way up the hair shaft and make the individual shafts thinner. Hair is like a chemistry project–here is its composition: 50% carbon, 21% oxygen, 17% nitrogen, 6% hydrogen, and 5% sulphur. Washing your hair – pollutants sit on the outside of the cuticle and so can easily be washed off, regular shampooing, for men, alternate days to every day and for women twice or thrice in a week. Changing your hairstyles – Hair can be exposed to breakage and split ends. Keep this in mind when using heat from a straighter, curling iron or hair dryer. Putting too much tension on the hair with a tight style such as a ponytail or braids can cause traction alopecia. The sun – keep your hair and scalp covered in the intense sun. If you don’t like wearing hats, apply products that can protect your hair from the sun, such as protective leave-in conditioner, or watered down sunscreen. The Norwood Scale is a classification of MPB for men, from remedial thinning to progressive hair loss; this makes it easier to understand the present grouping and determine the potential future loss. The Scale starts at 1 at its most minor up to 7 as the most aggressive form of hair loss, also staging the loss between hairline and crown; this is a useful guide even if not totally depicting your hair loss stage. The female version is known as The Ludwig Scale and works in a very similar way to categorise a stage of thinning. The pattern of loss is generally different but again gives a broad overview as to the condition of a person‟s situation. A hair transplant is not a hair loss cure, only the redistribution of hair, and in some cases, not all people are suitable for a hair transplant procedure. A hair transplant and medications can complement each other in providing the best result. There are only three FDA approved medicated treatments and therapies for the treatment of hair loss, although FDA approved it must be understood there is no cure and results can vary from person to person, and always consult a specialist before using. A hair transplant works because our hair around the sides and back is genetically strong (donor hair), we can remove some of this hair to replace lost hair over the top of the scalp (recipient area). Follicular Unit Hair Transplant Surgery is now the most refined form of hair transplantation. Greater skills have to be applied as well as time to excise the natural groups of FU intact. Follicular Unit transplanting separates the natural groups of hairs, from 1-4 hairs in each group, and thus enables the groups to be utilised in the optimum place in the recipient zone. There are two techniques, FUT or Follicular Unit Transplant and FUE or Follicular Unit Extraction, they differ in how the hair is removed, the rest of the procedure is basically the same. Before deciding to undergo any hair replacement or restoration treatment it is important to research and become educated as much as possible as to your hair loss stage now, and the potential for future hair loss.